A faint map of the eastern hemisphere on the diluvian earth, showing Noah's Ark resting on Mount Ararat. 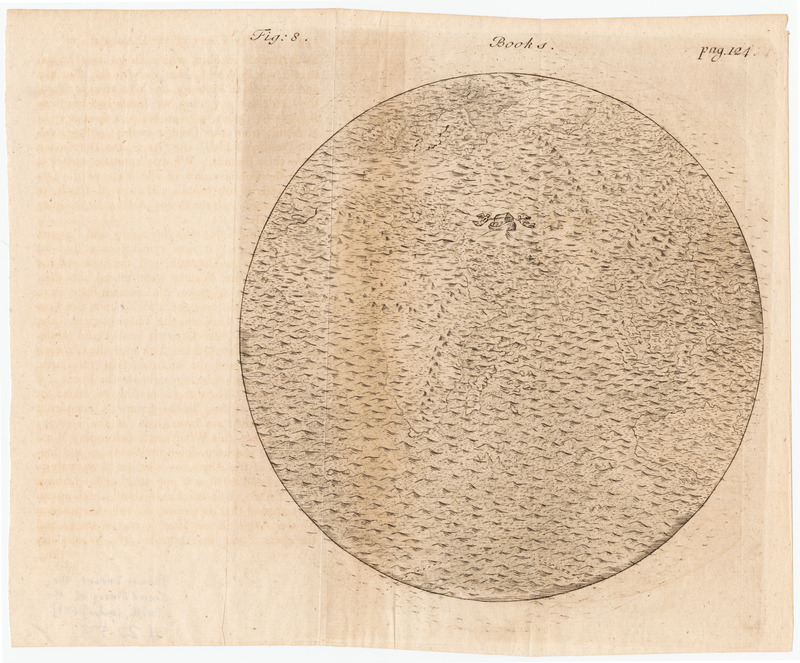 The map appears in Thomas Burnet's speculative work of theology and geology, The Sacred Theory of the Earth, Book I, "Concerning the Deluge, and the Dissolution of the Earth." The ark is shown surrounded by angels; in Burnet's words, "we may . . . suppose the good Angels to have look'd down upon this Ship of Noah's, and that not out of Curiosity, as idle Spectators, but with a passionate Concern for its Safety and Deliverance. . . . We may entertain our selves with the Consideration of the Face of the Deluge, and of the broken and drown'd Earth, in the Scheme, with the floating Ark, and the guardian Angels." Burnet's work was first published in Latin as Telluris Theoria Sacra, 1681/1689; the English edition first appeared in 1684/1689. The date of this copy is estimated; it is likely from the 1759 English edition. Burnet, Thomas. 1759. The Sacred Theory of the Earth: Containing an Account of its Original Creation, And of all the General Changes which it hath undergone, or is to undergo, until the Consumption of all Things. London: Printed for T. Osborn.